Geoffrey Whitting initially studied architecture and only developed an interest in potting when he came into contact with village potters in India during the Second World War. On his return he was deeply inspired by A Potter’s Book, the influential text which Bernard Leach had published in 1940. He taught himself pottery and set up workshops first in Worcestershire and, after 1971, at St Augustine’s Pottery in Canterbury. He became known as one of the finest exponents of the Bernard Leach tradition inspired by the simple forms and subtle, natural colours of early Korean and Chinese ceramics of the Sung period (960-1279AD). 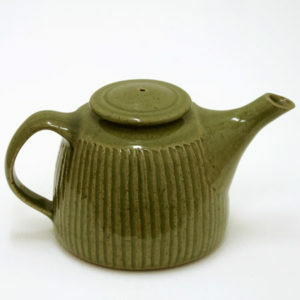 His Stoneware teapot with fluted decoration and a dark celadon green glaze teapots are especially admired for their simple elegant shapes and functionality.